Aerodynamicists use wind tunnels to test models of proposed aircraft. In the tunnel, the engineer can carefully control the flow conditions which affect forces on the aircraft. By making careful measurements of the forces on the model, the engineer can predict the forces on the full scale aircraft. And by using special diagnostic techniques, the engineer can better understand and improve the performance of the aircraft. Wind tunnels are designed for a specific purpose and speed range. Therefore, there are many different types of wind tunnels and several different ways to classify wind tunnels. In this section of the website we shall present various types of wind tunnels and discuss some of the unique features of each type of tunnel. On the figure, we show several examples of wind tunnels and their designation. Let us consider the various ways that we classify wind tunnels. Details for the various types of wind tunnels are provided on separate web pages. Wind tunnels are often denoted by the speed in the test section relative to the speed of sound. The ratio of the air speed to the speed of sound is called the Mach number. 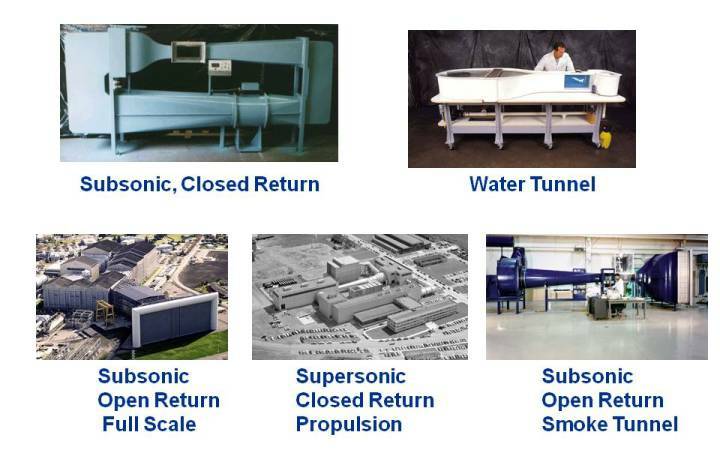 Tunnels are classified as subsonic (M < .8) , transonic (.8 < M < 1.2) , supersonic (1.2 < M < 5.0) , or hypersonic (M > 5.0). The distinction by Mach number is caused by the realtive importance of compressibility efffects. For subsonic flows, we may neglect the effects of compressibility; for transonic and supersonic flows, compressibility effects must be considered. For hypersonic flows, we must make additional considerations for the chemical state of the gas. The scaling effects of the Mach number can be theoretically derived from the conservation of momentum of the air in the tunnel. Compressibility affects the design of the test section of a wind tunnel: for subsonic tunnels, the test section has the smallest cross-sectional area of the tunnel; for supersonic tunnels, the throat of the nozzle has the smallest area and the test section area is chosen to achieve a desired Mach number in the test section. Wind tunnels are also designated by the geometry of the tunnel. A wind tunnel that is open on both ends and draws air from the room into the test section is called an open return tunnel. The tunnel at the lower right of the figure is an open return tunnel. A wind tunnel that is closed and re-circulates the air through the test section is called a closed return tunnel. The tunnel in the upper left of the figure is a closed return tunnel. A blowdown wind tunnel has a high pressure vessel upstream of the test section and a low pressure resevoir downstream of the test section. Blowdown tunnels are used for supersonic testing. For hypersonic testing, a variation of the blowdown tunnel called a shock tube is often used. Test times in a blowdown tunnel or shock tube are much less than in a continuous flow tunnel. NASA wind tunnels are often designated by the cross-sectional dimensions of the test section. The wind tunnel in the lower center of the figure is the NASA Glenn 10 x 10. whose test section is 10 foot high and 10 foot across. At the lower left is the NASA Ames 80 x 120, which is a full scale, low speed wind tunnel. Wind tunnels can be designated by the type of fluid that is used in the tunnel. For most low speed aircraft wind tunnel testing, air is moved through the tunnel. To visualize shock waves for high speed aircraft, or to study the flow around submarines or boats, water is used as the working fluid. A water tunnel is shown at the upper right of the figure. In some hypersonic facilities, nitrogen or helium has been used as the working fluid. Similarly, cryogenic nitrogen has been used for high Reynold's number testing of transonic flows. There are several wind tunnels around the world that are used to study ice build-up on aircraft parts. These icing tunnels include refigeration devices to cool the air in the tunnel and water spray devices to provide liquid droplets in the test section. Wind tunnels are often designated by the special pupose for which they were designed and built. Propulsion wind tunnels have special requirements for handling the high temperature exhaust from turbine or rocket engines. Flow Visualization or "smoke" tunnels must also handle the exhaust contaminants that are used in the tunnel. Wind tunnels that are used to study the stability of aircraft must allow the model to move freely within the test section. Certain high temperature facilities have been designed to more accurately simulate the high temperature effects of hypersonic flows.